KEY-OPERATED SWITCHES are recommended for machines installed in facilities where the control switches might be tampered with or accidentally activated. At the turn of a key, the control circuit is shut on or off. The mechanism takes the place of the standard control switch. 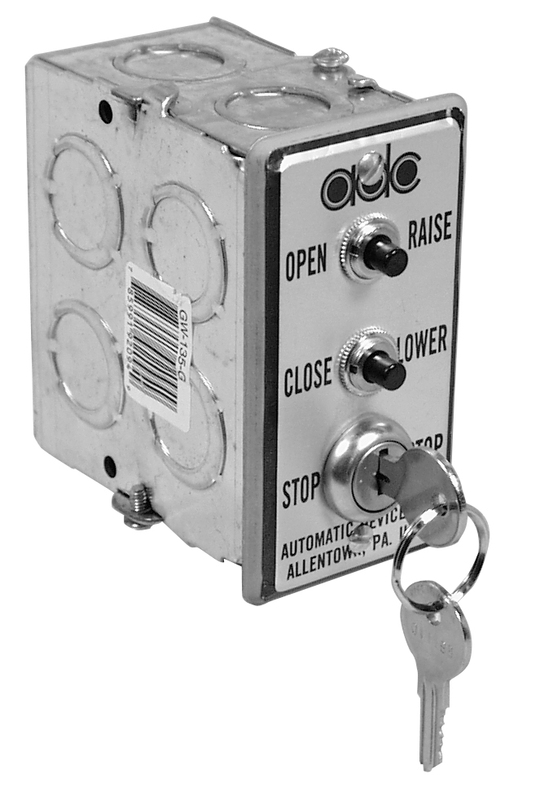 Model KOS-1 is a three-button (2 pushbuttons and 1 key-switch) type switch used with machines which include a magnetic control system (MCS). It has a brushed chrome finished plate and is furnished with a standard single gang J box. NOTE: the wiring schematic for drive wheel machines (Models 2914, 2917, 2928, 2950, 2960, 2961, 2962, 2963) is different than that for all other MCS machines. Please download the correct drawings for your machine model. Model KOS-2 is a toggle-type operator used with machines that do not include the magnetic control system. It is flush-mounted and has brushed chrome finished face plate. Only one KOS-2 can be used per machine. No additional remote controls can be used. These units are furnished with a standard single gang J box. Model KOS-1TV - is a four-button (3 pushbuttons and 1 key-switch) type switch used with machines which include a frequency drive module (TV option). It has a black Lamacoid face plate with white etched lettering and is furnished with a standard double gang J box.